We're a week in, and I think despite his resistance to some of the restrictions, even Matt is realizing this eating plan is working. My hands were raw from eczema a week ago - today, they aren't entirely healed, but now it's more of a dry skin issue, and I anticipate by Day 30, they'll be infinitely better. Our skin is clearer too already. It's really remarkable. Last night, Noah didn't sleep very well - he had a little fever and fell asleep early, then was up from midnight until about 2:30 a.m., then was up for good at 5. Needless to say, we all needed naps this morning. I feel like the forecasted need for sleep during the first few days of the Whole 30 is kind of hard to distinguish from regular, parents-of-an-8-month-old exhaustion. Because we ran out of eggs yesterday, I made a bit of a non-traditional breakfast: beef with broccoli. 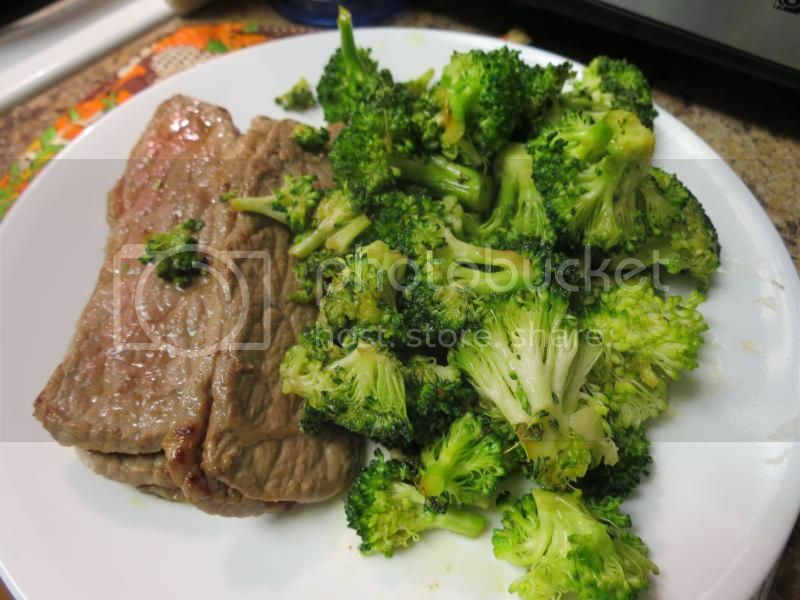 I cooked some stir fry pieces of beef in a skillet and then tossed some fresh broccoli in to cook in the steak's juices. It was pretty good - a bit dry, I don't usually make beef so I definitely overcooked it. Matt said it was good - he had it for lunch, after having last night's leftovers for breakfast. We've been using the smaller salad plates for eating, too. I'm sure we've all heard about using smaller plates so they appear fuller and you feel more satisfied. I don't know if it's that, or just that we don't need giant plates full of food, but it's working. When we got home, I made lunch - the steak and broccoli for Matt, a pear and half an avocado for Noah, and the other half of the avocado and some egg muffins for me. 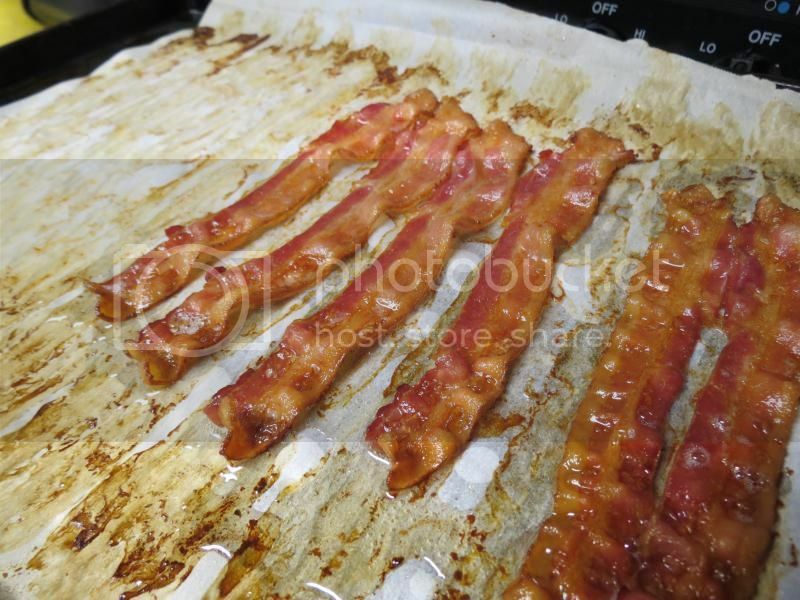 I also made bacon since we finally found some that is Whole 30 compliant. I cooked it in the oven - a single layer on a cookie sheet lined with parchment paper, in a 400ºF oven for 15 minutes. I froze some raw, had 3 pieces with my egg muffins, and put the rest in plastic bags in the fridge for when I make egg muffins throughout the week. Matt doesn't eat pork, so it should last for a while - I am not super crazy about bacon, I just thought it would mix things up a bit so the egg muffins weren't just veggies and/or ground turkey. 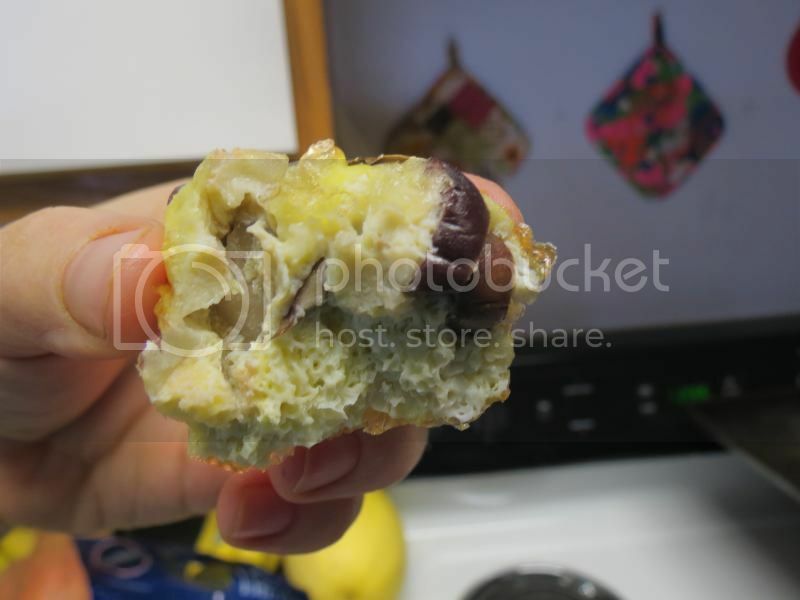 My egg muffins were delicious, by the way - kalamata olives and portabello mushrooms. 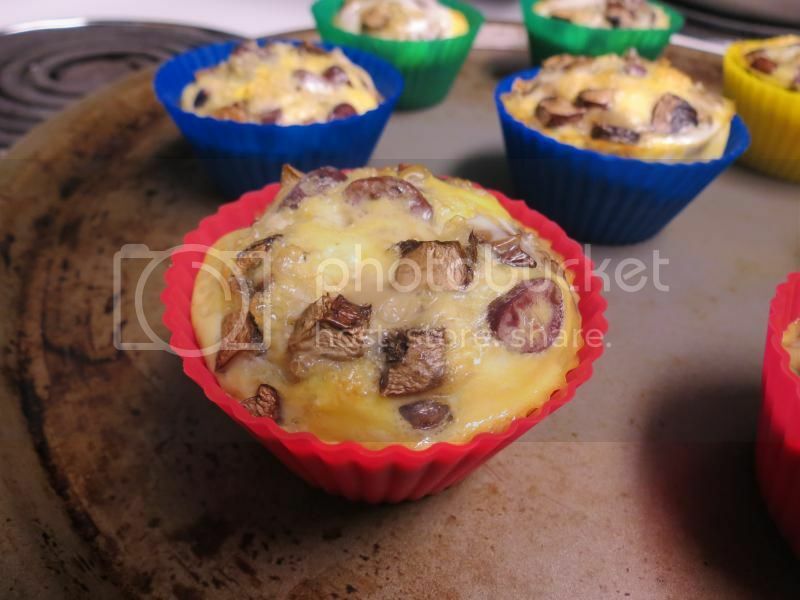 Interestingly, I put the olives and mushrooms in the bottom of the cups before adding the egg, instead of what I have been doing and mixing it all up, then scooping the mixture into each cup. After I baked them, the fillings had risen to the top, and the bottom was all egg. Not a bad thing, just interesting. After lunch, we got out Noah's stroller and took a family walk - the weather was gorgeous today, sunny and not too hot, not too cool. We walked for about a mile, then I sent the boys home while I went to the fitness center and rode the stationery bike for 30 minutes. It isn't much, but I know I need to ease back into it, or else I will hurt myself. I got a little emotional there, thinking about fitness, and how unfit I once was, and how athletic I became, and how I feel somewhere between the two (but closer to unfit) these days. Thinking about the times when I ran "only" 8 miles when the goal was 10. How I felt like a failure. If nothing else, regaining the weight and having to work my way back down again is giving me some good perspective. I hope that this time, I will fixate less on numbers and on trying to match/surpass this person or that person. I don't care about sub-whatever time races right now. All I want is to be fit again. After the gym, I came home, and got dinner ready for Noah, then for me and Matt. I made lemon pepper chicken. 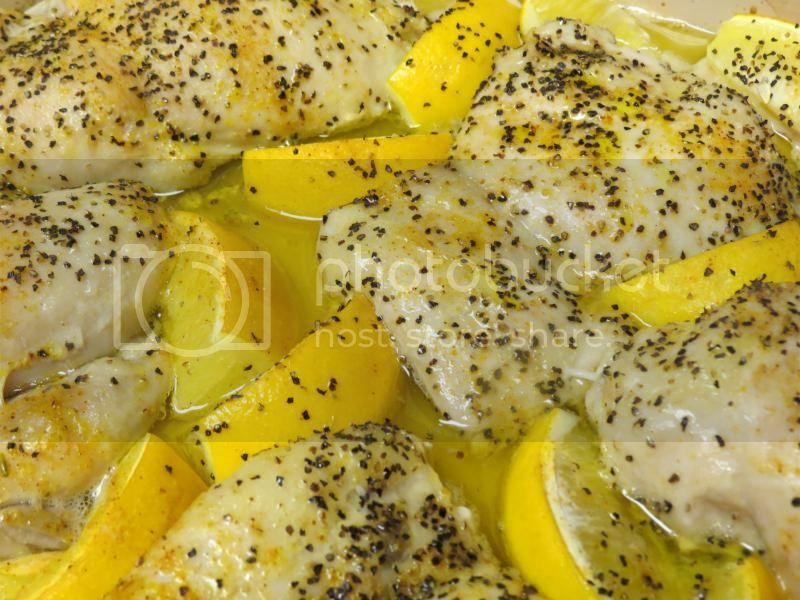 I diced up four Meyer lemons and gently squeezed about half of the wedges, then put all of them (squeezed and unsqueezed) in a baking dish with six boneless skinless chicken thighs. I sprinkled it all generously with pepper and baked it for 28 minutes at 375ºF. I used Meyer lemons because (a) they're not as sour as regular lemons and (b) they were cheaper than the regular lemons. It was really delicious! I made extra pieces, too, so we would have some for lunches this week. 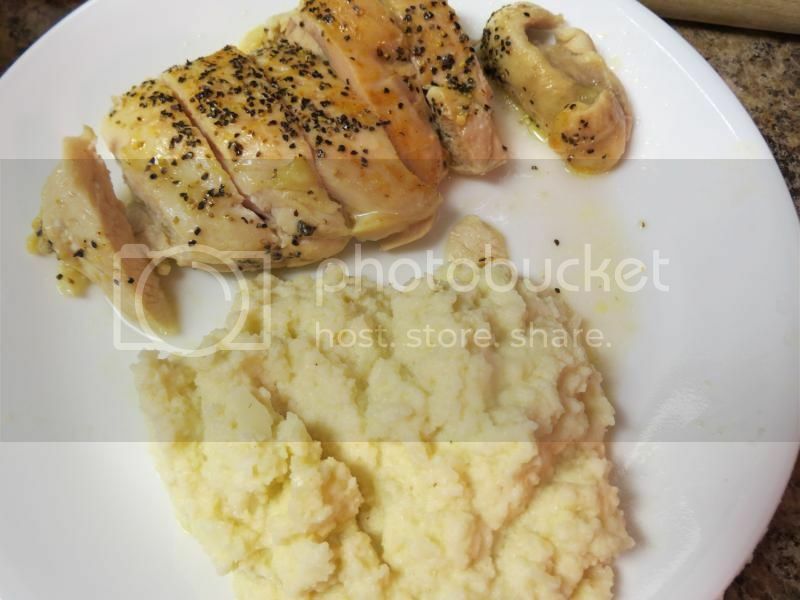 I served it with mashed cauliflower. It was so good! I couldn't tell you the last time we've made mashed potatoes - we aren't really potato eaters, besides sweet potatoes. And I like cauliflower a lot, so I thought this was good. Matt liked it, but thought it needed a bit more of some spice (I had just done salt and pepper, plus a spoon of the homemade mayo to mash it together into a mashed potato-y consistency). I'm going to hit the hay early tonight, heading into the office early tomorrow to get some things sorted out before I teach in the afternoon. One of my classes was canceled at the last minute on Friday afternoon, and my contract states I need to teach a certain number of classes, so I am entirely unsure of what is going to happen. It's been an insane beginning of the semester, and I hope it settles down quickly! Thanks for the regular updates! I'm really enjoying hearing about your progress and also seeing the meals you put together...I love all the ideas you have on throwing things together...and they seem so much simpler than the lengthy recipes I see other places. I definitely hear you on the grocery front. I try SO hard to make it cheaper every month and fail miserably every time. For the two of us... we spend about $800 on groceries. It's just sickening! I have such a hard time sacrificing health to save money... I'm bound and determined to figure out a way to balance both. We also plan on having a huge garden this summer - so maybe I can save more in the summer and that'll make up for the crazy bills once winter rolls around again! I've been following your blog for awhile now, missing Matt and you from afar, and I just had to tell you how much I enjoy reading it. You really are inspiring. I'm planting the seed in Eric's head to start this Whole30 business :) The holidays were way to kinda to both of us. I agree that eating healthy is MUCH more expensive. About 8 months ago we went on a gluten and soy free diet due to food sensitivities. My food budget for a family of 4 is $275ish a week. We aren’t quite as “whole food” as you because close. I'm a bargain shopper and I check the sale papers for the two major grocery stores where I live and I shop Walmart for all the toiletries, paper and such. We have a 99 cent store that has amazing food values too. I hope you can find better prices by shopping around. I realize time is part of the equation as well.